Legend showcases one of the widest ranges of Promotional Metal Pens, Roller Pens, Divine Range Metal Pens, Stylus Pens, Twist Metal Pens, Button Press Pens, Cap Press Pens and many more. We are known in the industry for manufacturing and exporting a quality range of Promotional Metal Pens, Roller Pens, Divine Range Metal Pens, Stylus Pens, Twist Metal Pens, Button Press Pens, Cap Press Pens and many more in various models, colors and other specifications. The products offered by us are known for quality attributes such as solid grip, easy holding, and smooth writing. 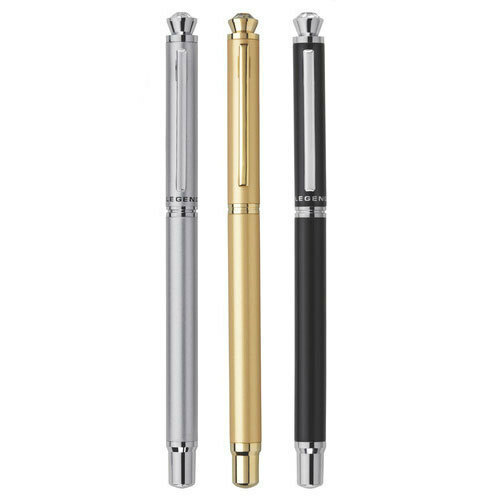 Owing to these features, our range of pens is hugely popular in markets across the globe.